Da Bears Blog | The Bears Are Young. How Did Ryan Pace Do It? The Bears Are Young. How Did Ryan Pace Do It? When Ryan Pace showed up following the 2014 season, he inherited the 3rd oldest roster in the NFL. The Bears were both old and bad – the worst possible roster combination. In 2018, they will be one of the youngest teams in the league. The progress has been slow. They moved from 30th the year before Pace came to 19th in 2015 to 10th in 2016, but then stepped back to 22nd in 2017 thanks largely to a number of ill-fated free agent moves (hello, Mike Glennon, Markus Wheaton, and Quentin Demps!). We won’t know the exact numbers until rosters are cut down, but the Bears’ average age in 2018 is going to be somewhere around 25 years old, which will likely place them as one of the 5 youngest teams in the league. Looking at their 90-man roster right now, there are only 4 players who will be 30 when the season starts: backup QB Chase Daniels and 3 guys who are primarily special teamers (Sherrick McManis, Patrick Scales, and Sam Acho). On the flip side, there will be a host of key players who are under 25, include Mitchell Trubisky, Jordan Howard, Anthony Miller, James Daniels, Cody Whitehair, Eddie Goldman, Roquan Smith, and Eddie Jackson. To put into perspective just how young the Bears will be, the 26 year old Leonard Floyd will be above average for a starter. To further put into perspective just how much work has been done to the Bears’ roster in the 4 years since Ryan Pace showed up, let’s look at the main players on the roster in 2014 compared to now. Ages listed are for how old the players will be on opening day. Wow. 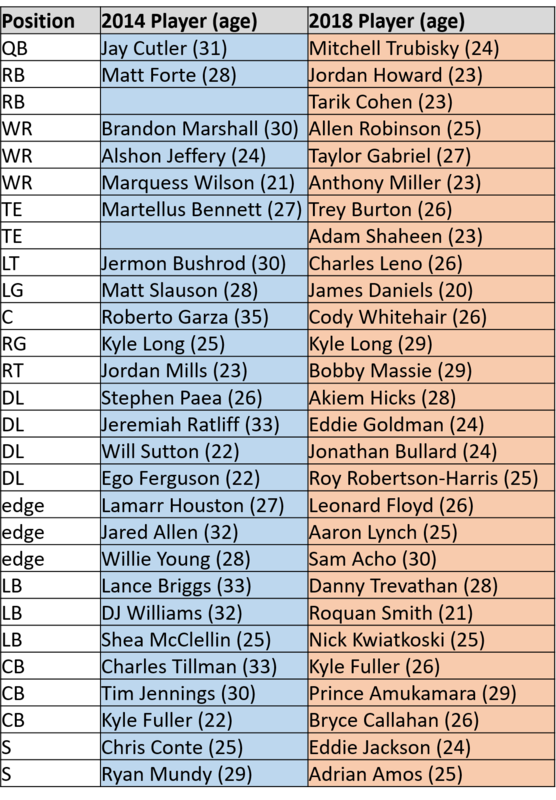 The key players in 2014 had an average age of just under 28 years, with 11 aging players (29+) and only 5 who were 25 or younger. This was largely because of years of bad drafting; only 9 of the 26 listed were playing on a rookie contract. Only 4 of them being 29 plus. 15 being 25 or younger. 16 of the 28 playing on a rookie deal. If you’re wondering exactly why the Bears have sucked over the last three years, take a good look at that 2014 roster. There were comically few good young players, which meant that it would take years of good drafting to build a good team. This is not to say that Pace has not made any missteps as he built the roster, but this image gives a greater appreciation for just how much work had to be done to get to where the club is today. Another thing to note is that the 2018 Bears are noticeably deeper than the 2014 version at the skill positions. I didn’t bother listing a 2nd RB or TE for the 2014 squad because there was nobody there worth mentioning,unless you happen to be related to Ka’Deem Carey or Dante Rosario. Even finding a 3rd WR was difficult; it was either Wilson, who finished his career with less than 800 total yards, or a washed up Santonio Holmes, who had 67 yards in 2014, the final season of his career. I look forward to seeing how Matt Nagy will utilize his deep and diverse group of weapons. It’s worth noting that younger does not necessarily mean better; the Cleveland Browns have consistently been among the youngest teams in the NFL over the last five years while averaging three wins per year. But many people think the Bears are positioned to take a step forward in 2018, and the exciting part is that should only be the beginning. As the young players continue to grow and mature, 2019 and 2020 should be even better. I know the last 5 years have been miserable, Bears fans, but now we’re left with a team full of young, exciting talent. With any luck, the next few years will make all the misery we’ve endured worthwhile.